Noise control systems have been difficult to design for the food industry because of the sanitation requirements. But ASI Aeroacoustics planned their system with sanitation in mind from the beginning. 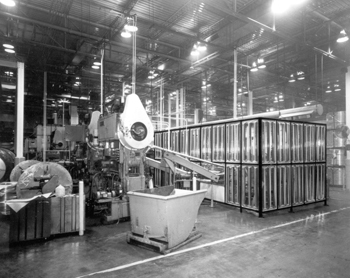 Past acoustical systems were often constructed of stainless steel filled with fiberglass. Openings in the stainless steel that exposed the fiberglass were debris accumulation areas. The fiberglass created a potential product contamination problem. Alphasonic Acoustical Systems reduce noise in excess of 20 dBA (decibels weighted on the A scale), depending upon the type of noise. Each 3 dBA represents a 100% change in noise level. The panels are transparent, lightweight, and portable.They are also functional as machine guards. The contoured design of the smooth, rigid, plastic panels eliminates cracks or crevices that can accumulate foreign matter. The entire system may be washed down or steam cleaned. With modular construction, every panel is independently accessible for easy removal, or, large assemblies can be removed for rapid dismantling. Visual inspection can be accomplished from outside the unit. The system can help manufacturers comply with OSHA noise regulations. Effective in August 1982, employers must administer a continuing, effective hearing conservation program for all employees exposed to 85 dBA Time Weight Average (TWA), or above. Employees exposed to 85 dBA and above for 8 hours must be given a baseline hearing test. Employers must also provide all employees exposed to 90 dBA TWA or above with personal hearing protection. The acoustical system reduces noise substantially, and may eliminate the need for hearing tests or protection devices. The panels also meet current FDA and USDA requirements, and the high impact rating satisfies machine-guarding requirements. The panels react to noise much as a solar panel reacts to light. The parabolic contours of the sheets reflect the sound energy and concentrate it along a media strip. The diffusion, absorption, and sound wave interference result in high acoustical performance. The panels can be easily cut or drilled with ordinary hand tools. An integral flange makes the unit easy to mount, hinge, or slide into larger barriers or total enclosures. The modular design adapts to any configuration. Units can be enlarged or reduced by 6" increments to completely enclose any undesirable noise source, such as can and bottling lines. Panels may be added or removed without disturbing adjoining components. Ceilings can be added, but often are not necessary. The panels are raised off the floor slightly, permitting air circulation. The system generally requires no ventilation since the panels dissipate heat quickly. 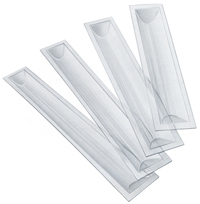 The low thermal gradient prevents condensation that could result in possible contamination.